No tears. Nope. And not a single sob. 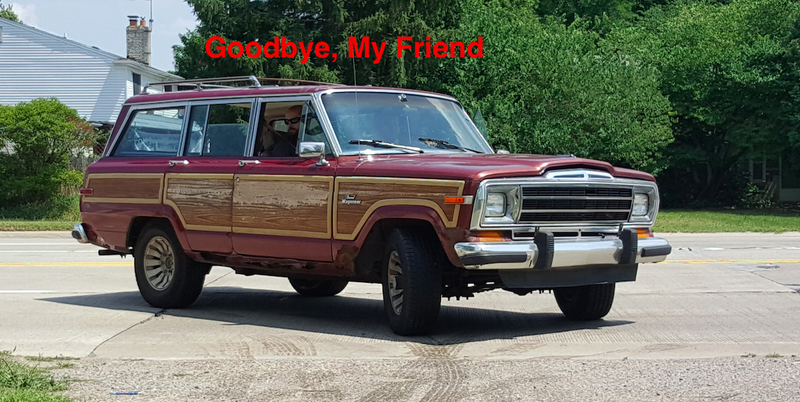 I just sold my $800 Jeep Grand Wagoneer—Project Redwood—and I’m totally fine. I definitely don’t feel empty inside, nor am I reminiscing about the Jeep’s incredible ride quality, its amazing reliability during my 3,500 mile trip to Utah, or just its endless amounts of soul. Again, everything is A-okay over here. How could I resurrect a vehicle literally out of the ground, then enjoy an incredible time with it as it coddled my buttocks in its comfy seats and with its cushy suspension, only to sell it off like it’s a damned consumer good. Project Redwood was much more than a consumer good. It was my friend. The day I met Project Redwood back in October of 2017, I fell in love. Yes, it was buried in dirt, it hadn’t run in 12 years, and its body was rusted out. But the huge panes of glass, the woodgrain, and that unmistakable boxy profile—despite being a clunker, it dripped with soul, and it captured my heart, as well as $800 from my wallet. Never more did that soul come out than during my road trip to Utah with my coworker Andrew Collins. It was one of the greatest trips I’ve ever been on, and that’s largely because of the way the Grand Wagoneer made me feel when I was behind the wheel. It’s the big, bulging hood, the airiness of the cabin thanks to all of the glass, the magic-carpet ride quality, the quiet and grunty V8, the buttery-smooth Chrysler 727 transmission, the wood trim, the chrome accents, the shag carpet—despite all the rust and leaks, these things shined through to make Project Redwood feel special, and to make me feel special. But now my friend is gone. As a general rule, I don’t buy cars with plans to sell them later. Every car I buy has the potential to be my life-long companion. But alas, with the purchase of my 1979 Jeep Cherokee Golden Eagle, I could hardly justify keeping the Grand Wagoneer. Especially since I could use the cash to start on another project. Selling the Grand Wagoneer was difficult. Even though the market for Grand Wagoneers is red hot right now (thanks, in part, to the vehicle’s prominence in pop culture), most of the folks who saw the big “for sale” sign on my Grand Wagoneer in my driveway (or who saw it on Craigslist or on Facebook Marketplace) stopped by to have a look, and then walked away. Those whom I had a chance to speak with told me the Saggin’ Wagon was a bit too much of a project for them due to the rust and the leaks. Dozens of folks stopped by my house to peek at what looked like a glorious machine from afar, but they all walked away without making an offer. It seemed that lots of folks wanted a cheap Grand Wagoneer, but none of them truly wanted a cheap Grand Wagoneer. Then there’s Jared. He had called and texted me for a few weeks about the Woodie, saying he was contemplating driving up from Dayton, Ohio. “Oh boy, that’s maybe not worth your time. It’s a very disappointing Jeep up close,” I said, worried that he’d drive four hours to Michigan and then vomit upon seeing the crusty Wagoneer. But Jared really wanted the Jeep. He’d done all his research, watching my videos, reading my posts, and asking me a bunch of questions. But no matter how many photos of huge rust holes I sent him, his interest in the Jeep remained strong. “Okay, fine. Come on up,” I conceded. He drove up this morning with a rental car, looked at the Jeep, wasn’t surprised by anything, and we made a deal. $2,150 for a reliably running, driving Jeep Grand Wagoneer with a solid frame but a very not-solid everything else. We dumped the rental car at Enterprise near my house, he drove me back home, and he and his buddy are now on their way back to Dayton. I have absolutely no doubt he’ll get there without any trouble, because Project Redwood is a beast. Jared really was the perfect buyer for the Jeep. He’s not too keen on doing mechanical repairs, but he runs a body shop, and has lots of experience replacing floors and rocker panels. So it only made sense that he’d buy a vehicle whose mechanical bits had already been attended to, so he can drive it around as he slowly gets the body back into shape. Yes, someone’s planning on fixing this rusty mess of a Jeep. And I can’t wait to see how it turns out. So as sad as I am about losing Project Redwood, I’m happy to hand the keys to someone who can provide it with the care it deserves.